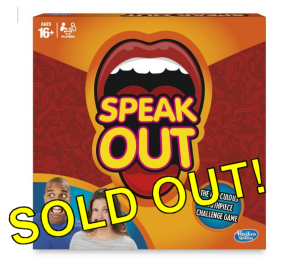 After a relatively slow sales during it's launch in August 2016, the Speak Out game from Hasbro is now completely sold out at major UK online retailers. Last week saw a massive rush of sales as videos of the game went viral over social media and coverage on various TV programs like The Late Show. This resulted in Argos and Amazon selling out of their current allocations last Thursday (15/9). The Argos website has since been releasing odd units of Speak Out Stock throughout it's UK stores which are being snapped up in literally minutes. Demand is currently sky high with the Stock Informer website seeing a large influx of visitors eager to get their hands on the must have game for Christmas 2016. Ebay has seen it's usual raft of sellers with prices varying considerably day by day. Currently average selling price is around the £35 mark, however we did see one auction on Saturday finishing at £78 including delivery!